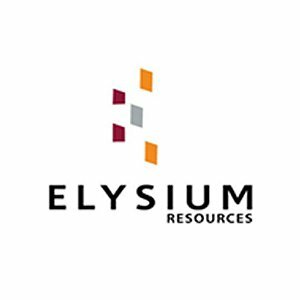 Mineral Exploration company Elysium Resources (ASX:EYM) has a highly attractive and promotable multi-commodity portfolio with plenty of future growth opportunities. Its portfolio includes a combination of copper, lead, gold and zinc assets, which helps protect the company against a downturn in prices of any one of the commodities. It has tenements across NSW and WA that it is looking to develop into profitable operating mines. Yet EYM’s current focus is squarely set on the eastern Lachlan Fold Belt in NSW — a world class minerals province and one of Australia’s largest mining regions. There’s good reason to be optimistic as EYM pushes ahead with its exploration activity. The Burraga region lies at the epicentre of the prolific Lachlan Fold Belt — famous for its base and precious metal deposits, including $16.6 billion-capped Newcrest Mining’s (ASX:NCM) Cadia mine and $3.8 billion-capped Evolution Mining’s (ASX:EVN) Cowal pit. For the time being, the company is concentrating its attention on its Burraga Copper-Gold Project in the Bathurst region of NSW, and has now completed phase 2 of its drilling program at the project’s Lloyd’s Copper Mine. From 1880 and 1920, then intermittently up to 1961, the Lloyds Copper Mine produced 19,443 tons of copper from 469,626 tons of ore implying a recovered grade of 4.14% copper. 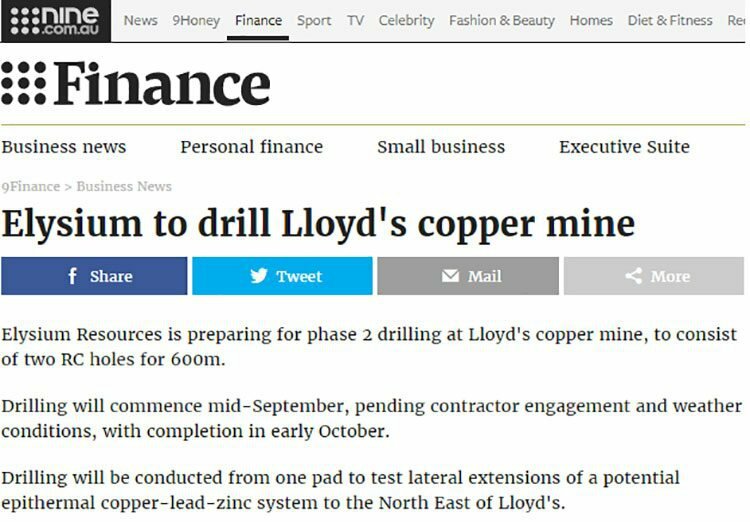 The initial focus for copper exploration is the confirmation of extensions to the original Lloyds Mine ore body. Assays are imminent from its second phase of RC drilling at the Lloyd’s Prospect and could prove to be the catalyst investors need to see the project’s potential reflected in the share price of this mining junior with big aspirations. With drilling at Burraga progressing nicely, the company also continues to stay on the hunt for large, high quality copper and gold deposits. 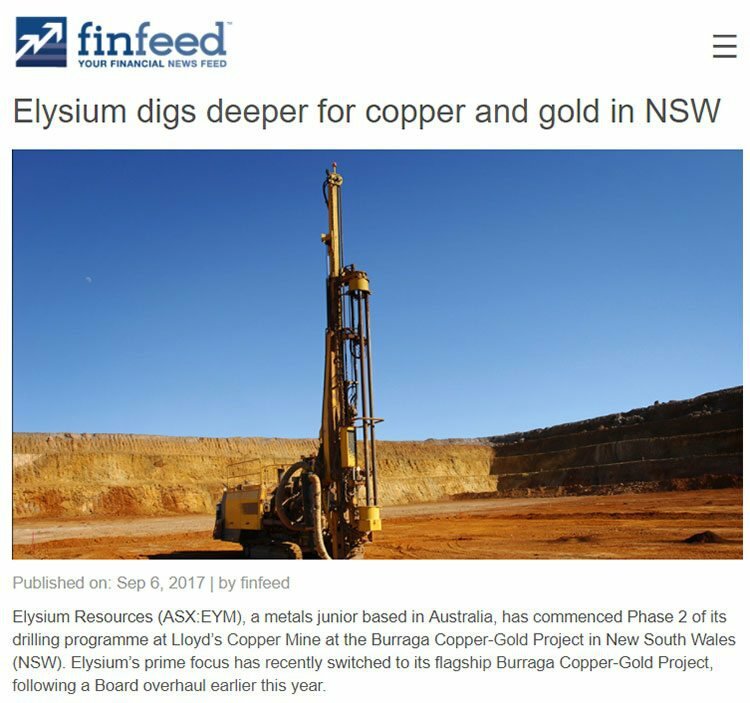 Aussie-based active metals junior, Elysium Resources (ASX:EYM), is well under way with its exploration programme at the Burraga Copper-Gold Project in the Bathurst region of NSW. The Burraga Project consists of three continuous exploration licences (EL6463, EL6874, EL7975) and one exploration licence application (ELA5454), over an area of approximately 221 square kilometres. These exploration licences encompass highly productive historical mine sites of Lloyds Copper Mine (produced 19,443 tonnes copper at grades of 4.14%) and Lucky Draw Gold Mine (1.41 million tonnes of ore at 4.2g/t gold from 1988-1991), plus the highly prospective Isabella and Hackneys Creek gold prospects. 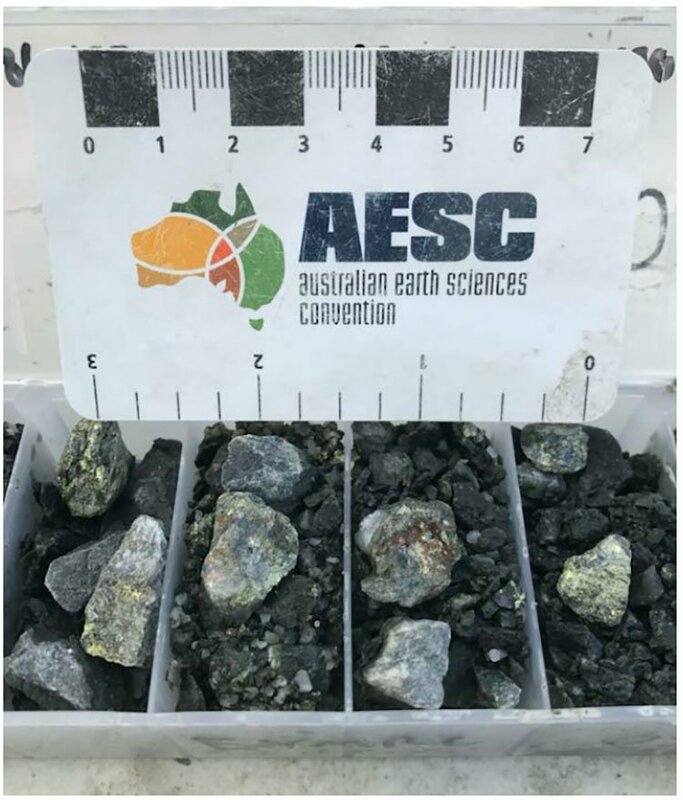 When we introduced you to EYM in late-July , the company was gearing up to begin phase 1 RC drilling at the Lloyds Copper Mine at the Burraga Copper-Gold Project. That drilling is now complete and the company has since completed phase 2 drilling, for which assays will be made available in the coming days and weeks. With a share price of just 0.8 cents, EYM is valued by the market at less than $4 million, yet it has a number of highly promising and rapidly progressing exploration targets on its books. The Burraga project is particularly appealing as it is perfectly situated in the prolific Lachlan Fold Belt. The highly prospective and historic Lachlan Fold belt in NSW is, as mentioned, home to $16.6 billion-capped Newcrest Mining’s (ASX:NCM) Cadia mine and $3.8 billion-capped Evolution Mining’s (ASX:EVN) Cowal pit. But these big name miners aren’t the only ones to benefit from operating in the region famous for its base and precious metal deposits. 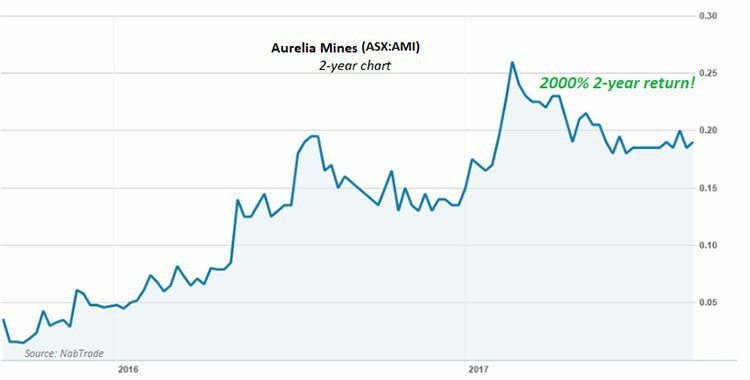 From mid-2015 to today, Aurelia Metals Ltd (ASX:AMI) increased its share price from a low of 1.2 cents to as high as 26 cents — a return of as much as 2066% in just two years. This is the type of potential that this region holds for junior explorers. If EYM is able to grab the attention of the market, it has all the potential to return similar hefty rewards. 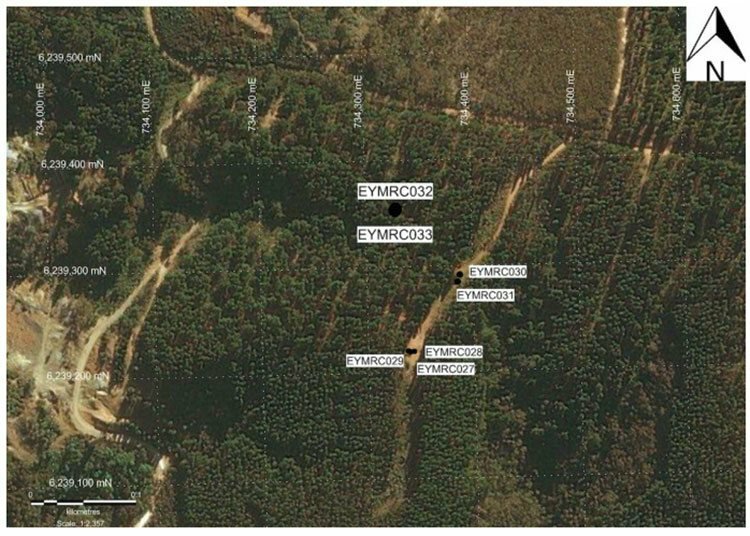 EYM completed Phase 1 of its exploration programme at the Burraga Copper-Gold Project in August, during which it discovered an eastern extension of mineralisation at the historical Lloyds Copper Mine, almost doubling the strike length of known mineralisation. Mineralisation at Lloyds Copper Mine is complex with stacked lenses which have some characteristics of an epithermal‐style system. 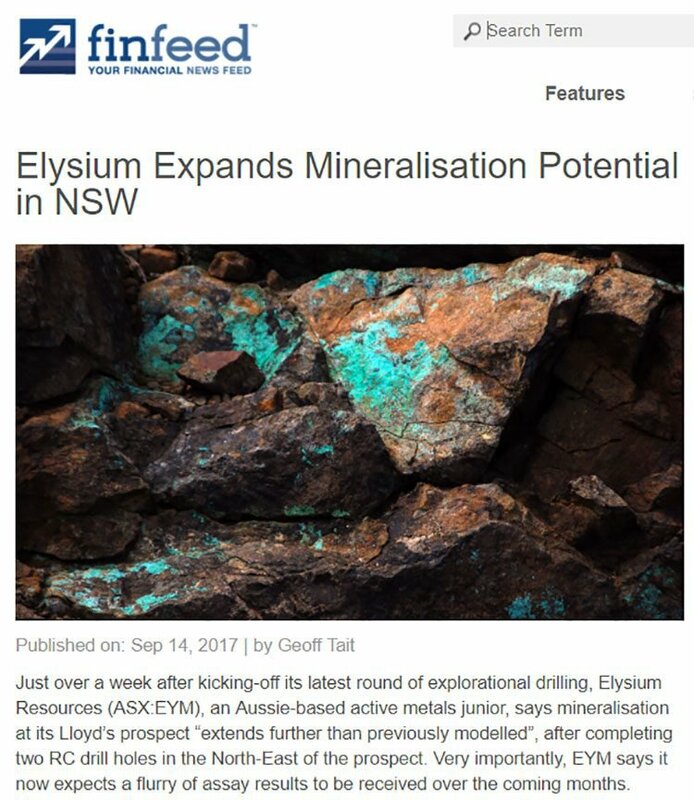 Following phase 1 drilling, on September 5, EYM kicked off Phase 2 of its drilling programme at the historic Lloyd’s prospect at Burraga. 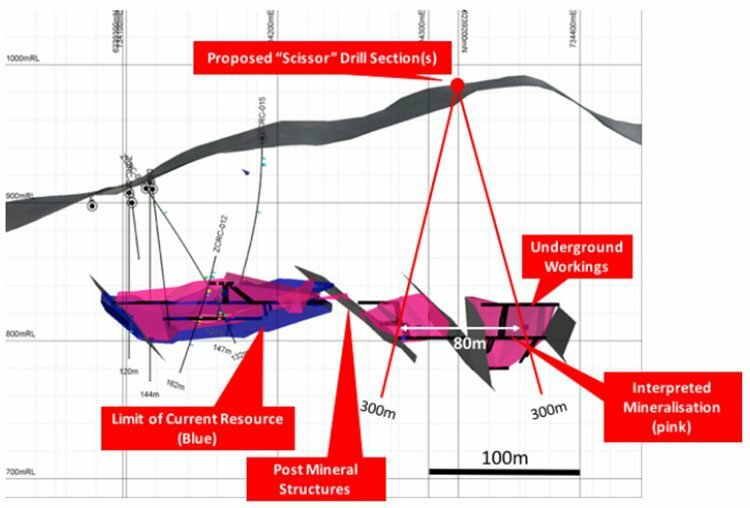 Phase 2 consisted of a two-hole, 600 metre reverse circulation (RC) drilling programme in the northeast of the historic mine. The drill programme involved the first RC drillholes to be drilled in 33 years in the north-eastern section of the project. 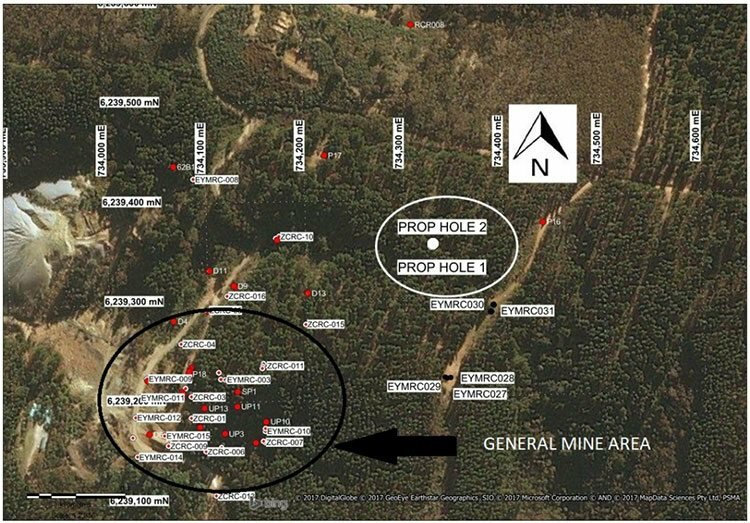 The image below highlights the location of these drill holes (Prop Hole 1 and Prop Hole 2), relative to the general mine area at Lloyd’s. Note that these ‘Proposed holes’ are now complete. This latest round of exploration drilling found mineralisation at Lloyd’s extends further than previously modelled, with visible chalcopyrite intercepted in both holes. These intercepts suggest that the mineralisation extends further to the north-east than thought. EYM had intended to reach a depth of 300 metres for each of the two holes, however both holes were cut short due to impenetrable ground. The now completed drill holes were designed to test targets generated from previous ore body modelling, as seen below. The holes in red are those that form an integral part of the Lloyds Copper Mine extension program. Having already drilled several drill holes in the east of the known resource at Lloyd’s, intercepting 9 metres at 2.3% copper, 0.1% zinc and 12.4g/t gold, EYM decided to conduct a parallel drilling programme from a single pad, as part of a ‘scissor’ formation drill holes as seen above, and reported by Finfeed .com on September 6. Drilling was completed on schedule and under budget and EYM expects a flurry of assay results to be received over the coming weeks. On top of this, core from historical drilling in 2015 at Lloyd’s prospect is undergoing sampling for further analysis with results to be available by year end. On top of Lloyd’s EYM is pursuing exploration progress at two other prospects its flagship Burraga Project, which it hopes will supplement its overall Resource footprint in future. 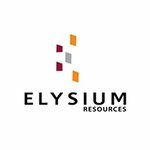 Elysium is also planning a 2000 metre RC drill program to test gold targets at the Hackney’s Creek prospect. 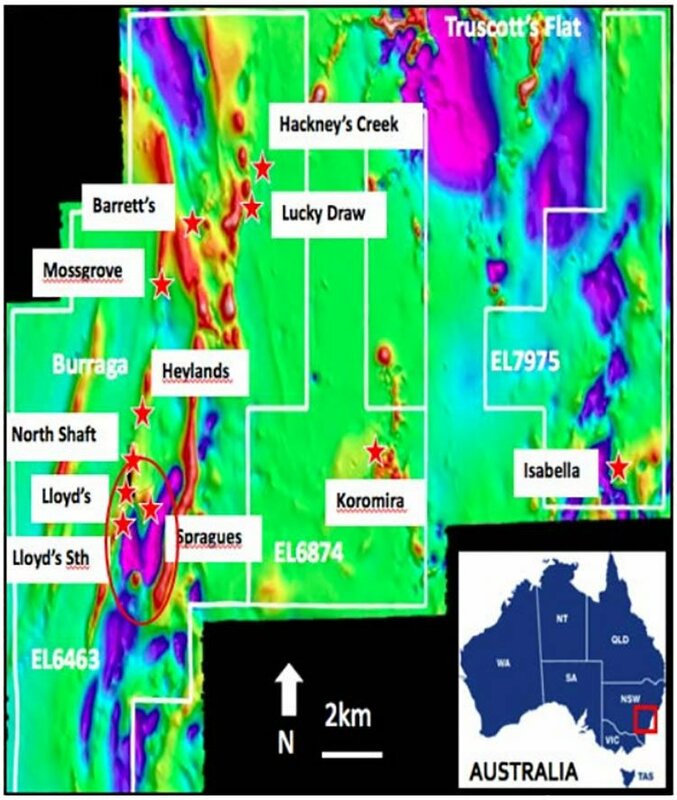 EYM’s highly prospective Hackney’s Creek gold prospect, is within two kilometres of the historic Lucky Draw and has potential to deliver EYM’s most prolific drilling results once drilling has been conducted and sample tested. It should be noted, however, that any further catalysts are speculative at this stage and should not be taken as guaranteed. Investors should seek professional financial advice for further information. A soil sampling program at the Isabella gold prospect will also be completed in order to identify future drill targets. 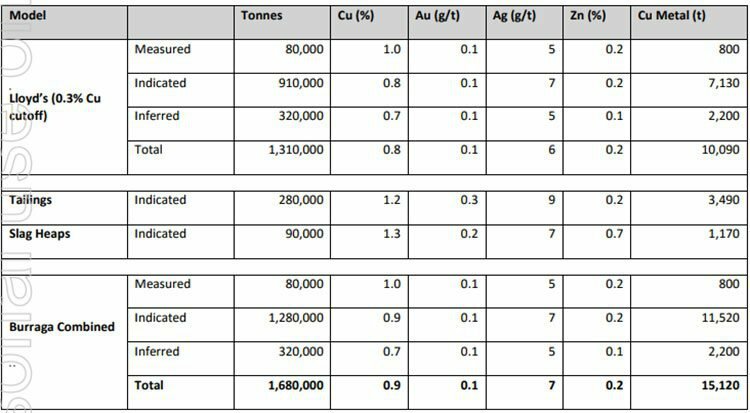 Drilling activity to be completed over the course of this year at Burraga Project will be added to EYM’s broader Resource portfolio which currently stands at 1,680,000t copper at 0.9% copper, 0.1% gold, 7g/t gold and 0.2% zinc — as outlined in the Mineral Resource table above. EYM’s focus is firmly fixed on progressing its flagship Burraga Project. This comes after a decision earlier this year to not renew its Malang Project in Indonesia, opting instead to save costs and re-focus on drilling at Barraga. 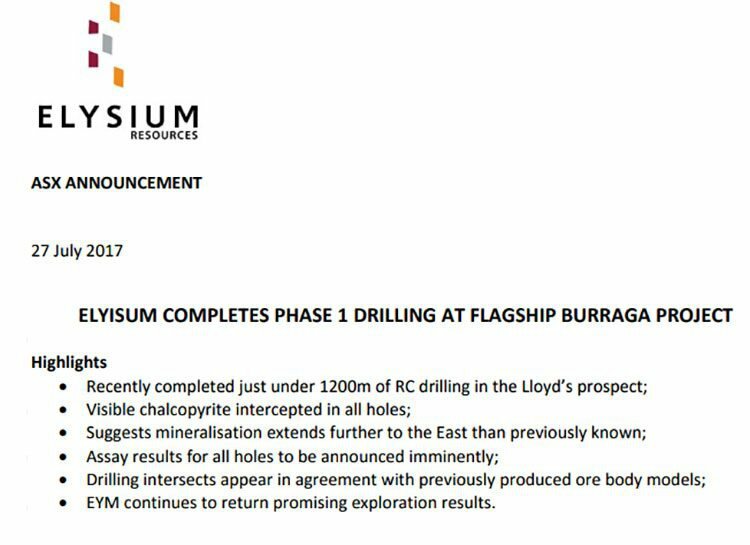 The second phase on RC drilling is now complete and assays should arrive from the drill programme at Lloyd’s within a couple of weeks. The company continues to investigate its previously underappreciated zinc and polymetallic potential with a renewed focus after revisions to the Board earlier this year, and in light of the positive outlook for the zinc price. This is while it continues with early-stage exploration and drilling.